1. 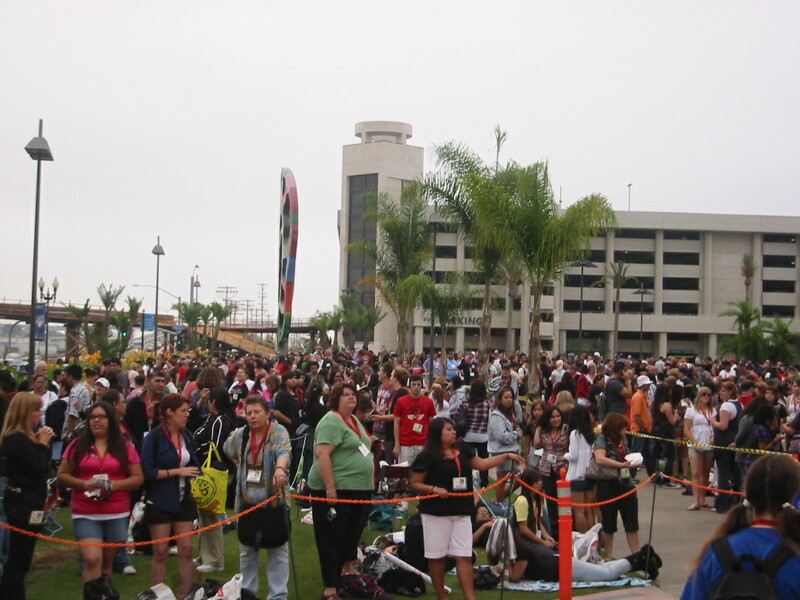 Embrace the pain; There is nothing easy, simple, or efficient with Comic-Con. Large crowds and scarce seating capacity will affect your attitude worst than a having a Ceti Alpha eel burrowed in your ear. So accept it and enjoy the fact that everything you do will take 3 times longer and will be 3 times harder. Surrounded by thousands of fans, you will not out-run or out-wit everyone. You’ll win some and lose some- and that’s okay. A positive attitude doesn’t happen by accident, it’s a choice. So go with the flow and be thankful that you were able to get a much coveted ticket to ‘nerdvana’. 2. Share the love: Getting to know new people can change everything. If you leave without meeting new fans, then you really have robbed yourself of the best part. By sharing your story and networking with others, your experience will be 10 times better. I know it’s hard for you introverts but remember, it’s a small world and taking a step of faith can open up all kinds of possibilities. A dinner invite, a saved seat, and Twitter follow can literally change your life. Don’t waste it by being your same, conservative self- take risks. 3. Bend the Spoon: This means believe in yourself and take initiative. Most of the time, it’s easy to let a key opportunity pass because of hesitation. When you see a celeb, writer, producer, or more importantly, a cute girl, go for it immediately. Don’t be obnoxious, but pay a compliment and ask a specific question. ”Wow, how did you make that costume? How does this Con rate with others? 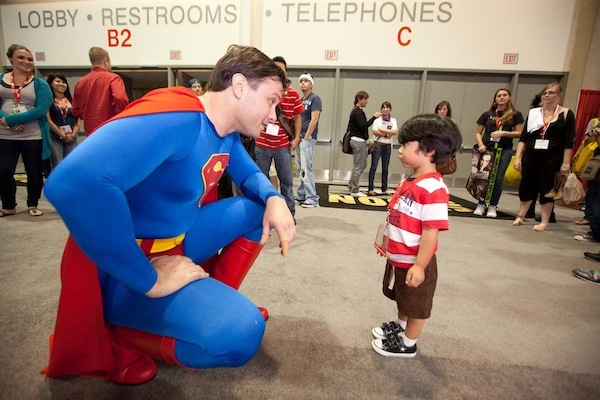 Were you always a Comic Con fan? Remember, celebs are real people too, treat them that way and they will treat you the same way. Gawking and asking for photos is what everyone else does. Also, be bold and ask a question in the panel. My friend asked a fun question to Eliza Dushku and we have laughed about it ever since. Be different and bend the spoon. 4. The Hangover Part III: Besides the great exhibitor floor, panels, and events to attend, the Comic-Con night life also offers an epic amount of opportunity. But beware. 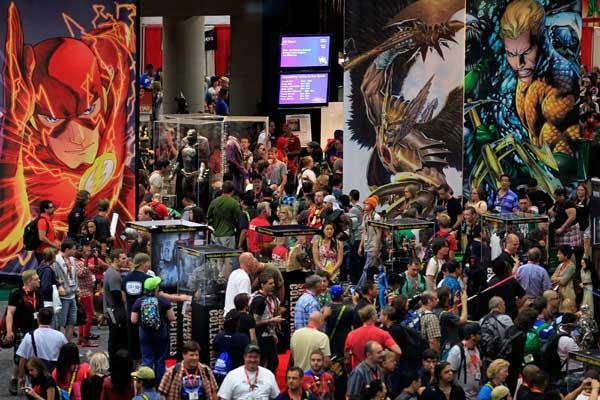 Even though Comic-Con is just a 4 day event, view it more as a marathon and not a sprint. One unlucky night of too much Romulan Ale and you will find yourself regretting it the next day. To maximize your experience, play it moderate and be at 100% each day. Your body will thank you by the end of the week. Don’t end up being the continuation of the Hangover franchise. 5. Play by the rules: No system is perfect and it only works is if we all play by the rules. That means you shouldn’t engage in line cutting or slipping into rooms. I know it’s nice to skip the line but remember that your faithful comrades have been waiting for hours (or sometimes overnight) and you wouldn’t want the same thing to happen to you. Pay your dues and support the system. 6. Be kind and rewind: Before you get upset about something, you will be surprise how far you can get by just asking with a smile. One time, I tried repeatedly to get a coveted Star Trek shirt by waiting in line and I failed several times. By just walking up and explaining my dilemma kindly, I got a shirt. These workers are fighting off the zombie hordes all day long so a little kindness will go a long way. 7. Let go of your personal space: I know it’s nice to have a buffer zone of seats around you while enjoying your favorite panel. But soooo many seats get sacrifices because they are not together. So as you see late comers wandering around, frantically trying to find seats, consolidate what is around you and offer multiple seating. I know it’s counter intuitive, but a compassionate gesture goes a long way. Who knows you might need it reciprocated back in the next panel. 8. Splurge on yourself: Unless you are fortunate enough to live locally, this trip is going to cost you- and this economy isn’t easy on anyone. But, this is the one time of the year to be less practical and get what you have been waiting for. You made it this far so spend a little extra on yourself. To you penny pinchers, stop doing the internal math and pull the trigger. Get that shirt, collectable, autograph, etc that you always wanted. It will last forever and hopefully the debt won’t. After a few years of going, I have forgotten one Con to the next, but the memorabilia has helped solidify it in my memory. 9. Level Up, the Hard Way: My biggest challenge to you this year is to personally thank a Comic-Con worker each day. Just pick one worker a day (or more if you like). 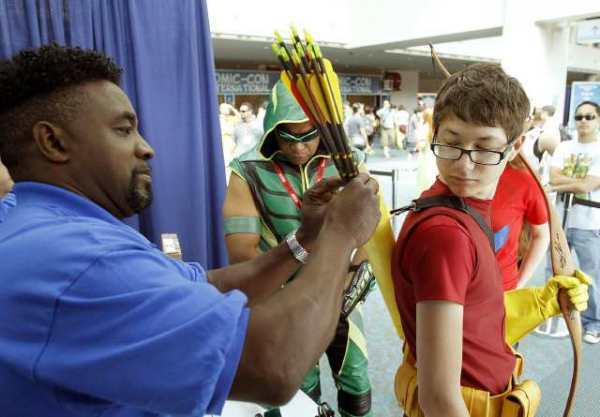 Whether paid or volunteer, these myriad of Comic-Con workers are fighting a hard battle. Massive lines, long days, and disappointed fans can really create a toxic experience and these guys have to deal with it all day long. I have had a chance to get to know some of the key workers in different areas over the years. They are hard working fans that are dedicated to running the best show possible. Pay them a compliment and thank them for their service. I know it will be hard, but trust me, it matters. Plus, it’s great for ‘leveling up’! Whatever it is, make it big and go for it. Comic-Con is not only about you finding other misfits but it’s also about you discovering yourself. Don’t just sit on it till the next CC but take steps and make your dreams come true NOW. All those stars, artists, producers, and directors you experienced were just like you at one time. All they had was passion and a dream and they made it happen. As Master Yoda says “Do or do not, there is no try”- or was that Mr Myagi? Either way you get the point. As a result of this trip, make 2012-13 the best year ever. Thank for all your support, comments, and feedback to my site this year. I truly hope you have a phenomenal Comic-Con and I hope to see you there! Another fine list Tony that I agree with 100%! It’s easy to let the “little things” pile up (lack of space, missing a panel, ect) and ruin your Con but if you just go with the flow, you’ll have a great time! Nice Tony. Thanks. Im ready now!!! I’ve always wanted to go to this! Great post! I wonder if Nicholas Cage would ever consider making a movie for The Cage, which is a comic book hero from back in the day! Great post, well said. I’ve been a couple of times already, and am going again this week, and this is great advice for everyone to follow. Have fun out there! Loved this. 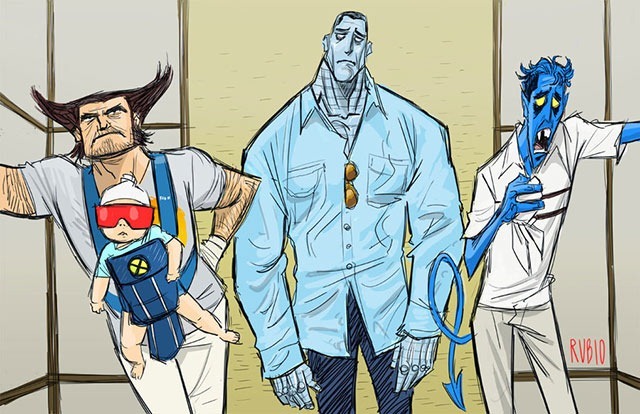 I had to skip SDCC this time because we’ll be moving and it would be too crazy. I got to attend ECCC though which was fun. These tips definitely apply for every con. Congrats on FP! Great post… thank you…. couldn’t make this year…. next year. Thank you for filling us on what the scoop. This is great! We’re not going this year (we went 2 years ago for fun and I ended up doing a book signing there last year), and I’m kind of bummed. It’s a unique experience for sure – a great place to people watch and browse and hear some great panels! I visited PopCon in LA this past weekend, and though not NEARLY on the same level, I think this advice is great for any situation where you are visiting celebrities and have a ton of fans about. EVERYONE is there to have fun, but we all have a responsibility to do our part to ensure it remains fun. Great post, thanks for sharing!! ComicCon = one of the most important items on my Bucket List. 😀 My dad has been a collector his entire life and I grew up with action figures instead of dolls. You definitely need to come out. It’s a worthy entry on your bucket list. Thanks for commenting! amazing piece!! networking and meeting new people is something we should all look forward to. Thoughtful and useful post. Congrats on being freshly pressed. Thank You and thx for commenting! 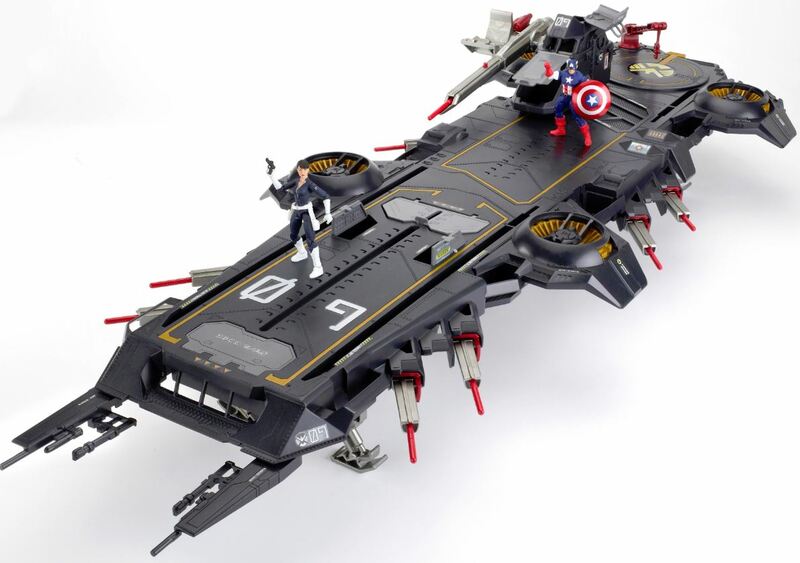 So ridiculously jealous. There are a lot of great Cons on the East Coast, but that is the Grail. One day I hope to get out there. Yea, you should come out. It is truly an epic experience. Nothing compares to it in the world. I know. I have a couple friends there this week (one set filming a documentary; another with a comic book radio show) and I really tried to get them to take me and I would carry their bags and gear. But alas; they already had peons set to do that. This is such a great post! I’ve never attended a Comic-Con before, but lately it has become one of my bigger dreams. 🙂 Now I’m even more excited to attend. I especially love your last bit of advice there: very inspiring. I’m surely doing whatever it takes to get there next year. It pains me that I won’t be there again this year. I had a great 10 year streak of CCI appearances, but no longer as I live in Florida. You pretty much hit all the finer points. Especially about the splurging on yourself and the seating. As a past volunteer worker, it was a nightmare to fill up those rooms properly with people finding seats for both themselves and their bags. C’mon now. I miss everything about it and I wish upon wishes I could attend as I used to. Have fun for me. Thanks for sharing. As a volunteer worker, you know how hard it is to get a seat for fans. Enjoy Florida and hope you make it back here someday! Great list dude, shame I live in the UK and can only attend the London comic con. One day soon I hope to be geeking it up at San Diego. Great article! 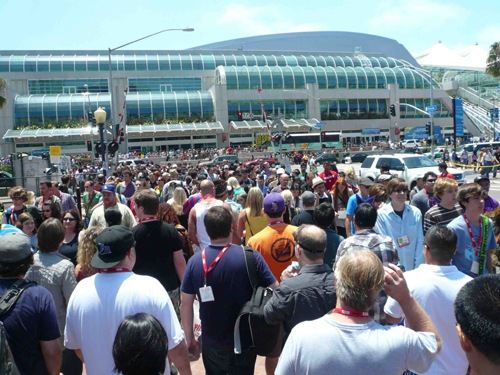 I’ve been attending SDCC for 11-12 years & it gets more overwhelming each year. Hope you don’t mind me adding to this. If your heart is set on seeing a panel in Ballroom 20 or Hall H, bring snacks, drinks, entertainment & expect to wait a while. If you get in line before your friends arrive, get to know the people around you & politely ask if it’s ok that you are waiting for a friend or two, but don’t get greedy & save a spot for more than that. Most of the time people are cool with it. Find the hospitality room. Previous years they supplied attendees who found it with free drinks & snacks. They’ve gotten stricter, but who wouldn’t pass up a free soda or M&Ms? Hint: it’s in the guide. Wow. I really enjoyed reading this. I’ve never been to a Comic Con (I don’t even live on the same continent) but I imagine it would so absolutely amazing. Moreover, most of the things I’ve read are about how exciting it is, how much there is to see, how to get the best stuff etc but yours is the first I’ve read about how to make it great for yourself and for others. Great post. Thank you! I hope you get a chance to visit someday. It would be worth the trip. Thanks for commenting! Love number 9! Great list! Imagination, the foundation stone of creation. It helps to be a bit crazy at times, it keeps us sane. I’ve always wanted to go to comic con and this just makes me want to go even more! That’s a great post. You truly have to find a “center” in order to navigate this con successfully, truly, happily, leave feeling fulfilled…that you gave it your all. You should also bring a Pez so you have treats to snack on. I live in New York and always wanted to go! Heard it was a cool event to attend! Thanks for sharing your tips with us and I hope you have a great time there! Sure will, thanks for letting me know. Good luck to you and thanks for commenting.